"GET YOUR PERFECTLY MANICURED HANDS OFF ME!" Kesha shrieked in horror the next morning, after finding herself being cuddled tightly by Demi. "You&apos;re stopping the blood flow woman!" Demi jumped awake and quickly detached herself from Kesha. "Oh I&apos;m so sorry," she said and blushed at how tightly she had clutched her. Suddenly a smirk appeared on her face as she pondered on what Kesha had just said to her. "Perfectly manicured hands? Did I just get a compliment?" She teased, over dramatically throwing her hands to her mouth and letting out a huge gasp. Now it was Kesha&apos;s turn to blush. She scowled sullenly, refusing to look at Demi. "No, it was not." She replied sharply. "It was.... Well, it was simply.... A way of getting your rather heavy body off of me!" She said, now glaring at Demi. "Hey, I&apos;m not heavy!" Demi defended herself quickly. "You&apos;re just extremely light!" A silence fell over them at the mention of weight, a painful reminder of the horrible events the night before had held. "Well I think it was a compliment," Demi said determinedly. She was speaking a little more quietly now. Flashbacks of last night invaded her mind, ruining the good mood that she had woken up with. "Well it wasn&apos;t, and there&apos;s nothing you can do about it." Kesha said stubbornly, smirking. "Oh no?" Demi said slowly. Kesha&apos;s smile fell and she glanced nervously at Demi&apos;s face. Suddenly, without warning, Demi was towering over Kesha and tickling her like there was no tomorrow. Kesha screamed and desperately tried to wriggle away. "No, Demi! No," she spluttered through her giggles. "No, please!" Demi laughed along with Kesha, feeling like it had been before. "Say it," Demi teased. "Say Kesha gave her favourite cousin Demi a compliment," she sang happily. "Never," Kesha yelled as she laughed. "I can&apos;t lie anyway," she pointed out. 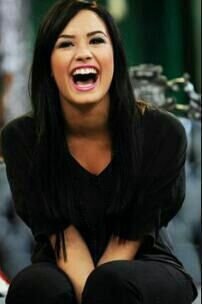 Demi tilted her head to one side, still tickling her. "What if Dallas is my favourite," she giggled. Demi mock gasped and tickled Kesha harder. "Say it, we all know you love me best!" Demi teased again. "Stop," Kesha gasped. She was beginning to become desperate for Demi to stop. Demi noticed this and became a little gentler with her, still tickling her though. "Go on," Demi encouraged. "Please!" She drew out the word please. "Nobody likes a beggar Demi," Kesha spluttered. At that, Demi tackled Kesha down she she was laying flat on the bed and then straddled her. She carried on tickling her the whole time. "Kesha," she said in a fake stern voice. "I play nice now, or no Marry Poppins for you!" She wagged her finger in front of Kesha&apos;s noise with one hand and tickled her with the other. "I&apos;ll bite that off," Kesha threatened sourly. Demi simply shrugged and started to chant the words &apos;say it&apos; over and over. "Okay! Okay, I&apos;ll say it!" Kesha gasped, not being able to take it anymore. "Kesha gave Demi a compliment," she growled. Demi squealed and pulled her into a tight hug, rocking them side-to-side joyfully as she did so. "I knew it!" She cried happily. Kesha tried her hardest to wriggle away, but had no such luck. Demi suddenly stopped rocking and became dead still. "Demi?" Kesha asked nervously. "Are you alright?" "No," Demi breathed. "Kesha... What&apos;s this?" Kesha felt her heart beat stop, right there and then.